On Wednesday 03/20/19 at approximately 2 am Troop A troopers responded to #99 Church Road in Sherman after a resident of the home, James Marharg called 911 and reported that an individual residing in the residence had fallen and struck his head on the countertop. Upon arrival Patrol units located the deceased within the residence. Due to several suspicious circumstances, the Western District Major Crime Squad and the Danbury State's Attorney were requested to respond to the scene. After an extensive investigation by WDMCS detectives, an arrest warrant charging James Maharg with Murder and Tampering with or Fabricating Physical Evidence was submitted to and approved by the Danbury Superior Court. A court set bond of $2,000,000 was assigned to Maharg. This was not a typical day for detectives in major crime however. While they were interviewing the suspect he collapsed, falling out of his chair and began having what appeared to be a medical emergency. Detectives immediately checked his pulse, he had one, but he was not breathing and they observed that he was beginning to turn blue. They attached an AED (automated external defibrillator) but no shock was advised. Detectives administered respiratory breaths with a bag valve and then provided him with oxygen until the ambulance arrived and transported him to the hospital. 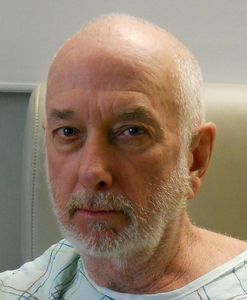 Maharg remains in the hospital at this time. He was arraigned bedside today and is in DOC custody at the hospital. The detectives who interviewed him, Detective Edmund Vayan and Detective Jared Barbero, along with Trooper Giancarlo Ardolino and several members of the Statewide Narcotic's Task Force, did an amazing job of saving this man’s life. Their ability to seamlessly go from interview mode to taking lifesaving measures and actively saving his life, is a true testament to what we as troopers do every day.